SAR125844 is a potent intravenously active and highly selective MET kinase inhibitor, displaying nanomolar activity against the wild-type kinase (IC50 value of 4.2 nmol/L) and H1094Y, Y1235D, M1250T, L1195V, and D1228H kinase domain mutants (IC50 values of 0.22, 1.7, 6.5, 65, and 81 nmol/L, respectively). SAR125844 is an ATP-competitive and reversible inhibitor. The biochemical selectivity of SAR125844 is documented in a panel of 275 human kinases and against tubulin. SAR125844 is moderately active on RON, a close structural homolog of MET, with IC50 value of approximately 740 nmol/L, suggesting that SAR125844 is highly (>100-fold) selective for the MET kinase over RON. 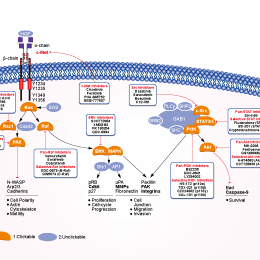 Minimal inhibitory activity is identified on 5 additional kinases with IC50 values below 300 nmol/L, including TRKA/NTRK1 (39 nmol/L), TRKB/NTRK2 (280 nmol/L), PDGFRα-V561D (55 nmol/L), AXL (87 nmol/L), and MER (105 nmol/L). Biochemical activities on Aurora A and Aurora B are detected with IC50 values of 320 and 820 nmol/L, respectively, but these activities do not translate into cellular activity as demonstrated by the lack of antiproliferative activity in tumor cell lines without MET gene amplification. No activity on tubulin is detected up to 25 μmol/L of SAR125844. SAR125844 inhibits MET autophosphorylation in cell-based assays in the nanomolar range, and promotes low nanomolar proapoptotic and antiproliferative activities selectively in cell lines with MET gene amplification or pathway addiction. In PK studies in mice, the oral bioavailability of SAR125844 is low (∼2%), in line with its moderate Caco-2 permeability. In female SCID mice bearing xenograft tumors based on the MET-amplified Hs 746T human gastric tumor cell line, a single intravenous administration at 20 mg/kg is performed. plasma exposure of SAR125844 (area under the curve (AUC)) is 6190 h·ng/mL, the clearance moderate (CL = 3.1 L/h/kg), and the volume of distribution is large (Vss = 4.2 L/kg). A rapid and sustained uptake of SAR125844 in tumor tissue is observed, associated with a slower decrease of concentration from tumor tissue compared to the plasma concentration. The clearances of SAR125844 in mice, rats, and dogs are moderate. The plasma terminal elimination half-life (t1/2) is moderate (rats and dogs) to long (mice). The volume of distribution at steady state is moderate in dogs and large in rodents. In two MET-amplified human gastric tumor xenograft models, SNU-5 and Hs 746T, intravenous treatment with SAR125844 leads to potent, dose- and time-dependent inhibition of the MET kinase and to significant impact on downstream PI3K/AKT and RAS/MAPK pathways. Daily or every-2-days intravenous treatment of SAR125844 promots a dose-dependent tumor regression in MET-amplified human gastric cancer models at tolerated doses without treatment-related body weight loss. MKN-45, Hs 746T, and SNU-5 cells are seeded in poly d-lysine 96-well plates in complete medium. Plates are incubated with increasing SAR125844 concentrations for 1 hour, cell lysates are generated. Ugolini A, et al. J Med Chem. 2016, 59(15):7066-74. Egile C, et al. Mol Cancer Ther. 2015, 14(2):384-94. Features:The first selective c-Met inhibitor to be advanced into human clinical trials.